The capital city of Washington D.C was the home of many tiny independent record labels. 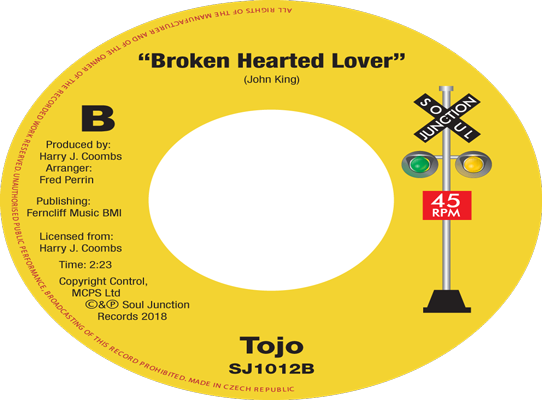 It is from one of these labels Tec whose stable of artists included The Fawns, The Four Jewels, JJ &G, Roscoe & Friends, and Tojo that Soul Junction has licensed two Harry J. Combs tracks for a 45 release. Roscoe Bowie Jr was a talented horn and keyboard player who honed his skills as a jazz musician in and around Washington, D.C. As an arranger Roscoe Bowie’s name can be found on many generic Washington records such as Leroy Taylor’s sublimely soulful “Oh Linda/Nobody Can Love You” (Brunswick 55345), The Ascot’s Mir-A-Don sides Miss Heartbreaker, Anytime and Sometimes I Wonder. When Knight Brother Jimmy Diggs (of “Temptation ‘Bout To Get Me” fame) briefly accepted an invitation to join Larry Bell and Jerry Norris in the vocal trio The Carltons, it was Roscoe who arranged the first two of their 3 excellent Argo 45’s “Can’t You Hear The Beat/Ooo Baby” (Argo 5470) followed by “Easy Living/Hey, Mr. Lonesome” (Argo 5482). Roscoe also featured as the arranger on another fellow Washington, D.C artist Andy Magruder’s 1964 outing “Later Than You Think/Do You Wanta Go” (Chess 1910) released under the artist name of Andy Mack, using The Carltons as backing vocalists. During 1960 record producer Harry J. Coombs found and began managing five young men, two from Arlington Virginia and three from the Washington D.C area. Their performing name was The Versatiles, and their members included two lead singers, Jeyone (Jay) Wiggins and James (Buddy) Owens, 1st tenor Robert Barnes, 2nd tenor Victor Brown and Bass Bobby Douglas. The Versatiles were a working group who performed cover versions of the hits of the day. Harry later arranged for The Versatiles to enter an amateur talent contest at the world famous Apollo Theatre in New York with them winning a very creditable third place. Not strictly under contract to Harry Coombs and having not recorded any original material, The Versatiles signed a recording contract with a boyfriend of Jay Wiggins sister. The boyfriend being Philly producer and recording entrepreneur Richard Barret (who later managed the Three Degrees from the early 1960’s until the early 1980’s), again with no material being recorded and feeling somewhat disenchanted with their Philadelphia experience the group returned to Washington. At this juncture one of their lead singers Jay Wiggins left the group to pursue a solo career which saw him record the 1963 low rider classic “Sad Girl/No Not Me (IPG 1008) which was later picked up for national distribution by Amy, Mala, Bell. Harry used several local musicians such as pianist “Porkie” Johnson and guitarist Buzzy Bowie (who later toured with Major Lance)on his sessions. Following the departure of The Versatiles, Harry took another act under his wing, with their rehearsals often taking place in Buzzy Bowie’s basement, during one such rehearsal Buzzy’s older brother Roscoe then predominantly a horn player sat in on the session, with the scheduled session finishing early. 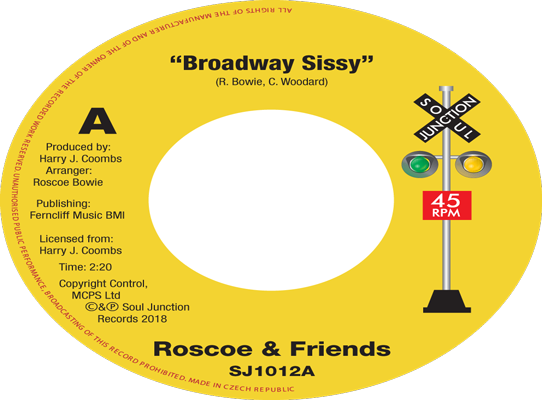 Roscoe joined the band in a jamming session and it was here that “Broadway Sissy” and “Barnyard Soul” was first created. Before being recorded under the artist name of Roscoe & Friends and released on the Washington Tec label. Harry had also been previously approached by former Versatiles 1st tenor, Robert Barnes to record him as a solo artist, Harry had always been impressed by the angelic quality of Roberts’s voice and as such was only too happy to record a 45 on him. The results of which being the pleasant ballad “Blue Lover” backed with the uptempo dancer “Broken Hearted Lover”. The song was released under the artist name of ‘Tojo’. With “Tojo” being Robert Barnes nickname back in the day. Harry J. Coombs himself was to go on and enjoy a hugely successful career in the record business, firstly through promoting his own records that led to him securing himself a sales job at Washington’s famous Waxie-Maxie’s Record Store. Later moving onto Schwartz Brothers Distributors for awhile before leaving Washington for Chicago to set up and run Ramsey Lewis’s Ramsel Record label. It was Harry who was responsible for signing Wade Herbert Flemons to Ramsel. The Ramsey Lewis Trio, of Ramsey (Piano) Eldee Young (Cello) and Red Holt (Drums) had previously scored a hit with their instrumental version of Dobie Gray’s hit “The In Crowd” but in the aftermath of their hit a major dispute caused Young and Holt to Leave Ramsey (later forming their own Young-Holt Trio, Unlimited etc). Red Holt’s eventual replacement drummer with the Ramsey Lewis Trio was Maurice ‘Toons’ White (Later of Earth, Wind & Fire). Maurice although never credited had written a song with Wade Flemons (again later of Earth, Wind & Fire) entitled “Jeanette”. Harry liked the song and booked some studio time at the Chess studios. At the end of the session Maurice and Wade both agreed that the song lacked and needed some vocal harmonies. It just so happened that the Dells were in the building at the time, and upon being asked duly obliged in adding the vocal harmonies on the next take. Harry initially pressed a 1000 copies and through Phil Chess, secured some radio play with Herb Kent *The Cool Gent” on WVON AM. “Jeanette” failed to hit at the time, but eventually found a home within the UK Northern Soul Scene some 20 years later. This is just one great memoir taken from Harry J. Coombs excellent book. Coombs “My Musical Journey” published by Ferncliff Music which features many highlights and anecdotes of Harry’s time as a Record Executive with CBS Records, Ray Charles, Capital Records, Gamble & Huff, including his own contribution to the Philadelphia International Records global success story and later his success with Levert. A highly recommended read for soul fans of all eras. With acknowledgments to: Harry J. Coombs.